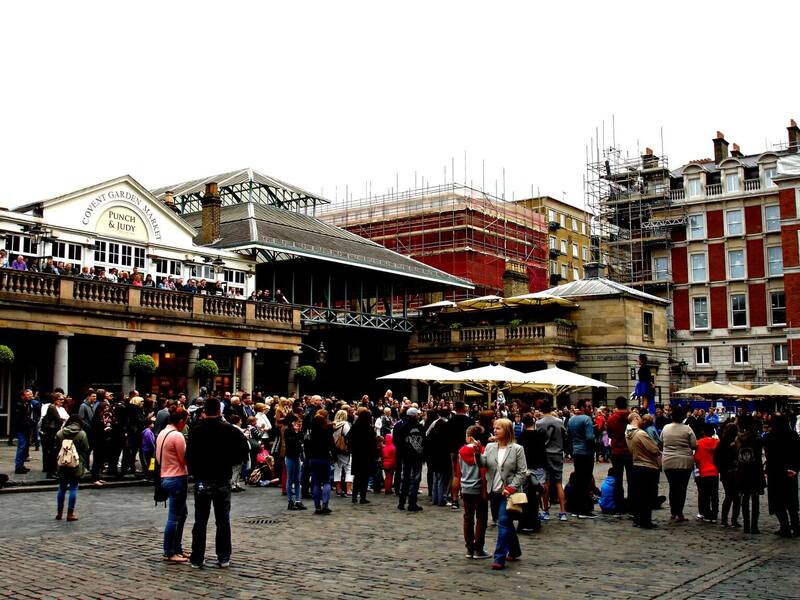 Covent Garden was once the capital’s most modern and trendy square, then it morphed into a fruit and veg market, and finally became an extremely disreputable courtyard to London’s theatre district and the Royal Opera House on the corner. Mama says. She won’t say why it was disreputable. I suspect sugar is involved. The banal edibles have since been sent off south of the river, and I have no idea what has happened to whatever the other thing was. Fear not. The very 19th Century steampunk market building, all fancy metal girders, glass rooves and classical stone columned entrances has not gone to waste. It is now colonised by stalls selling upmarket handicrafts for the tourist trade, and rather boutiquey shops doing similar. And the Apple store, although oddly enough this does not sell many Bramleys. Mama tries not to go in here. Shame, as they have a whole bunch of those wonderful touchscreens and seem happy to let us play with all of them. Mama is worried that she might get carried away and bet the house or something I gather. She can resist everything except temptation. She quite fancies a nose round the Moomins emporium though. But generally, we prefer the bit of in the slightly more down-at heel area to the back. It has a higher proportion of trashy plastic toys and souvenirs, and there’s a much better chance Mama might buy us something. Still, we don’t really come here to shop. We come here for the free(ish) entertainment. 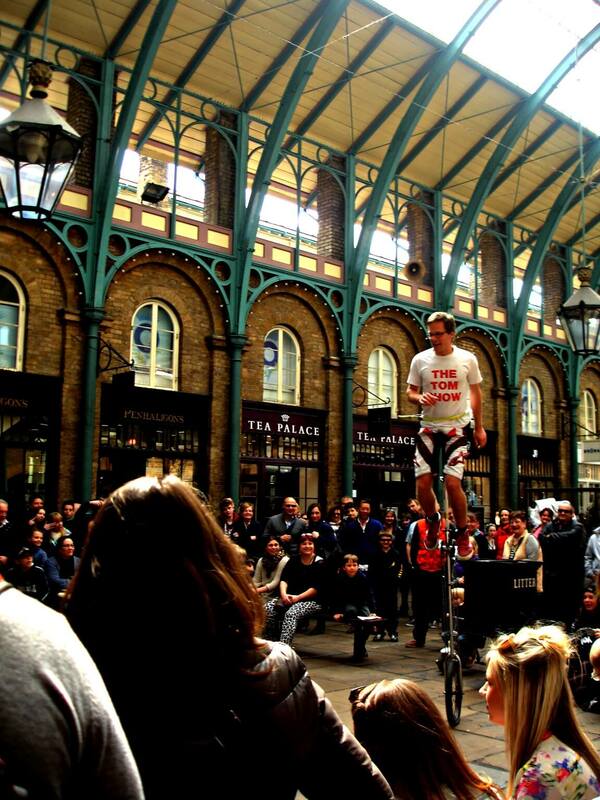 Covent Garden has living statues, highbrow buskers and street performers in various locations throughout the market going at it throughout the day, and we can quite easily spend an hour or two wandering from one to another before grabbing a bite to eat and going for a mooch around the back streets leading away from the piazza. I find the statues a little freaky and alarmingly avaricious. They move when someone gives them money. I wouldn’t mind so much, but unlike so many throughout the rest of London, none of them are of horses. Mama quite likes to check out the classical musicians playing in the sunken courtyard in the middle of the market. She lives in hope that one of them will be a solo bassist one day, but will put up with a really good soprano any day of the week. Lean on the balcony overlooking the performance or use this as your coffee break and occupy one of the tables down below. – Spin out one really good trick for a good twenty or thirty minutes – the length of each performance. This is quite a feat, Mama thinks. Anyone can wow with back to back showstoppers for ten minutes. Only the best can pull this off. – Involve the artist at some point pretending s/he has never done (this version of) the trick before and has learned it off YouTube the night before. 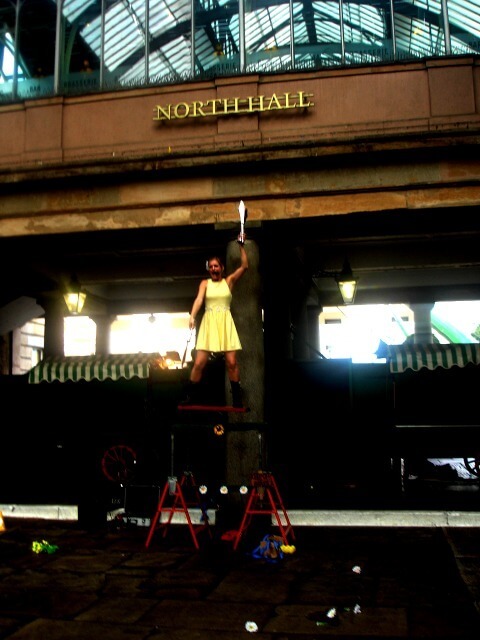 – Include two of the elements of juggling with sharp implements, balancing on something precarious, magic or dragging the showperson’s body through a tennis racket. Clearly combining three things would be too much. – See people pulled out of the audience to take part. This is usually fairly burly middle-aged men or a particularly chippy looking twelve-year-old boy. If you are either of these and do not fancy taking part, stand well back is Mama’s advice. But do not get too complacent if you are a woman. Just as you think you are safe you will encounter the man on the pogo stick. – Discover that at least one of these glamourous assistants has a hitherto undiscovered flair for comic timing. More props to the performers for really knowing their stuff. – Have lots of heckling. Of the crowd by the act. Clap loudly, do whatever they tell you, and NEVER stand behind the performers or you will be publicly humiliated. Especially, do not stand behind the showperson with your back to the proceedings ignoring what is going on while wiping some dirt off your wife’s face. Says Mama, shuddering. – Emotionally blackmail the crowd into parting with money. 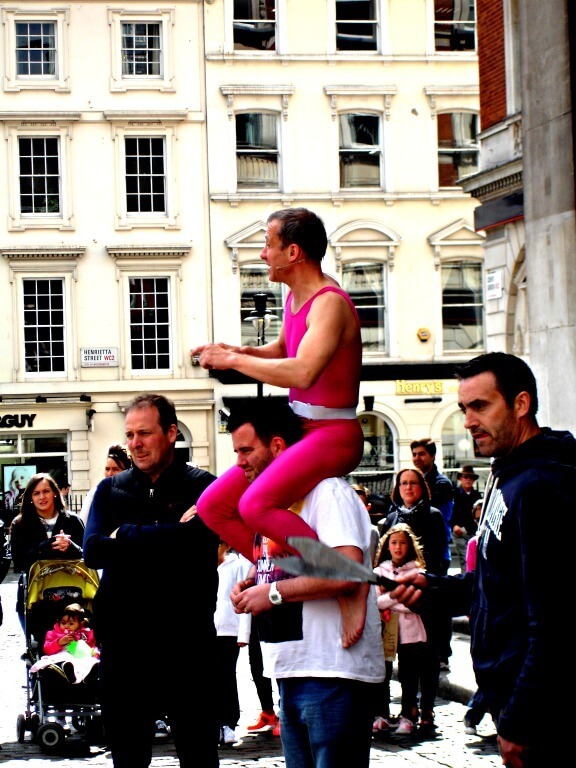 £20 is a standard amount, apparently, although the performer, who, you will find out repeatedly, does not get paid by Covent Garden authorities to be there, will reluctantly accept a fiver for the support of their seventeen children and their stalwart attendance in rain or shine. Mama tends to give a pound or two, but then she is mean. It’s great. And if you do get bored, there are pigeons to chase across the fabulous obstacle course of cobblestones, and also the London Transport Museum, which is one of the best museums for the under tens in London. And! Public art. Currently, for example, someone has floated the whole market facade up in the air and then tethered it for our amusement. We seem to have just missed its unveiling last week, which is a shame, but it’s on until 24th October, so there’s every possibility we might get to marvel at it in person. It’s called ‘Take my lightning but don’t steal my thunder’. No, I don’t know why either. As for refreshments, there are plenty of cafes and food stalls, and also plenty more in the streets around, and many of these put out chairs on the square in the summer. Brought your own sandwiches? There’s a nice little spot in the grounds of St Paul’s church with some benches and room to run around away from the crowds. The toilets are close by there too, which Mama always feels is an important piece of information for those with preschoolers. 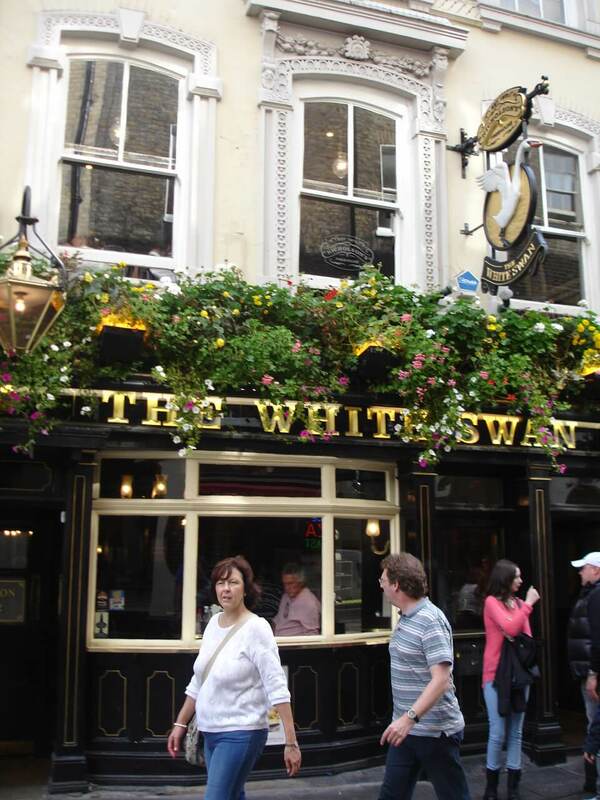 Mind you, Mama recommends that you step away from the square a bit so you can nosh at a pub which appeared in the novel ‘Murder Must Advertise’ by Dorothy L Sayers. Why? Because Lord Peter Wimsey spent time there. What other reason do you need? Says Mama. Anyway. 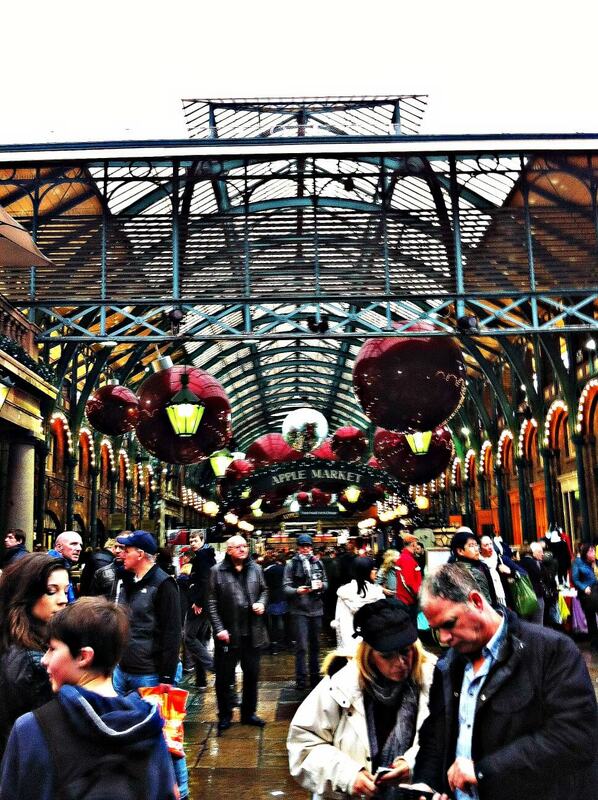 Covent Garden is an excellent fair weather hang out for the whole family, with plenty going on throughout the year. It’s never dull! But it might be quite crowded. This is what the Hitchhiker’s Guide to the Galaxy has to say about easy to perform magic tricks. Opening: The area doesn’t close as such, although the shops and performers and so on keep normal London opening hours. Price: The piazza is free, but you ought to bring some money for the performers. By tube/ train: Covent Garden station is currently exit only and probably rammed due to repairs. Better to use the stations of Leicester Square, Charing Cross, Holborn, Temple of Tottenham Court Road, all within about a ten minute walk. By bus: There are any number of buses which stop nearby. Look for ones going to Aldwych or Trafalgar Square for the closest drop offs. By car: Do. Not. Go. By. Car. Well now, Mama spent 18 years living 30 minutes away from London, and not once did she go there without taking the tube to precisely the place she was visiting. No wandering the streets for her! Papa, however, is a big city boy and has no truck with this sort of behaviour. It’s surprising (says Mama) how close eveything in central London really is. I think getting around London is not so scary – but it is often incredibly frustrating! Glad you had a good time at Britmums. Wildly jealous! It is somewhere that really grows on you, I think. Glad you enjoyed it! Hi, I’ve only ever been to Covent Garden once and that was about thirty years ago. It seems to have changed a tad since then! It sounds a fascinating place to visit, although I’d be too scared to watch the performers or I’d only watch the ones who happily excepted a couple of pounds…Twenty pounds is a bit steep, or maybe I’ve been out of the country for too long!. When we visit Athens we see street performers, but not to the same extent and to be honest the live statues look as if they are falling apart, much like the Parthanon!